Nepal is a country of diversity. This Himalayan country should be in “To Visit List” of every travel enthusiast. For the time poor and cash rich travelers, this 50 min. the experiential flight provides a perfect opportunity to get an aerial view of mighty Everest and other eight thousanders. If you are not trekking towards the mountains, this flight will be a great opportunity to view the mighty Himalayan range in the North. The best thing about this flight is every individual will have a window seat and travelers will get a chance to view the Himalayan range from the cockpit and click superb pictures. These scheduled flights are operated in early mornings from Kathmandu After taking off from Kathmandu airport the flight curves and flies over Dhulikhel towards Jiri offering panoramic views of peaks like Langtang (7246m), Mt. Shishapangma (8027m), Mt. Dorje Lakpa (6975m) and Mt. Lapchi Kang(7367m). Now the flight banks towards north to provide close-up views of four 8000’s giants Mt. Makalu (8479m), Mt. Lhotse (8501m), Mt. Everest (8848m) and Mt. Cho Oyu (8153m). It passes over Namche Bazaar and glides back over Solu passing by Mt. Numbur (6956m) and the bulk of Gauri Shankar (7145m). After you land back in Kathmandu after this aerial Himalayan tour each individual will be provided completion certificate. You may not have touched Everest physically, but you will have touched it from your heart. This will be a perfect setting for one of your evenings in Kathmandu, your ears and eyes will be tuned to the cultural music and ethnic dances. Same time your taste buds will be stimulated by ethnic meals. During the program, you will be served with “Raksi” Nepali local rice wine. Though the evening will end the memory of it will remain for a long after. Nepal is famous for the world’s best trekking trails such as Everest and Annapurna trails. It is not only walking up and downs, it is also about immersion into mountain culture, seeing how the landscape changes as you gain the altitude and sometimes it may simply be an ego reaching the base camp of the highest monuments in the earth. Though it may be any case if you are physically fit and you have long vacation do not miss the opportunity to walk through these famous trails. You may also try Langtang trail, which is close from Kathmandu. Also referred to as “City of Lakes and Mountains” this tranquil city is less polluted and less populated in comparison to Kathmandu. Once you decide to do Nepal tours, Pokhara must be in your “to visit” list. 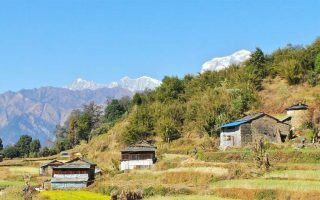 Once you are in Pokhara Valley, Mount Fishtail seems to rise from the valley floor. The reflection of this mountain in Fewa Lake while boating is once in a lifetime experience. For those who are planning for honeymoon tours, do not miss Pokhara. The tourist area of lakeside stretched out along the southeast shore of the valley’s largest lake. Lakeside has its own charm, especially in the evenings when darkness hides the clutter and shops are lit up like a Christmas tree. Foothills separate Pokhara from the Himalayas. You may enjoy paddling around Fewa Lake enjoying the beauty and tranquility of the lake with the picture perfect reflection of the Himalayas on the lake. You must visit Sarangkot to witness the illumination on the majestic Himalayas. Walk around the Fewa Lake in the evening sipping beer that is easily available in the lakeside restaurants. If you are arriving via air, Kathmandu will be your first destination in Nepal. The only one international airport in Nepal is in Kathmandu itself, so definitely this is the start point of tour Nepal tour/treks/holidays. Being the capital of the country, it is a racial melting pot filled with man-made treasures. It is a living culture museum. If culture interests you, the most you will get it during sightseeing tours in/around Kathmandu. Two other cities of Bhaktapur and Patan inside Kathmandu valley have artistic and architectural traditions that can compete with anything you might have seen abroad. Chitwan is among Asia’s finest national park, renowned for its variety and abundance of wildlife, and its top-class tourist lodges and Jungle activities. For the wildlife enthusiasts national park in Chitwan provides a rare opportunity to see last remaining elusive Bengal tiger in their natural habitat. Tigers may be elusive, however, you will have good sightings of one horned Rhino (Indian rhinoceros) listed as a vulnerable species.